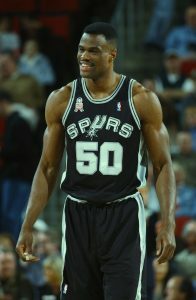 San Antonio Spurs legend David Robinson was announced as one of the speakers for this year’s Wall Street Conference that is happening in Texas on January 19th to talk about his investing business that he built after retiring as an athlete. He is likely to reflect on and discuss his motivations that he had prior to starting this new adventure and share what he learned along the way. It is going to be a very engaging talk that allows the audience to get to know the former basketball player on a different level, as well as learn a thing or two about the business industry at the same time. Robinson is a two-time NBA Champion and a 10-time NBA All-Star that played his entire 14-year career with the San Antonio Spurs and participated in three Olympic Games. The famed San Antonio Spurs center position is a two-time NBA champion and also played for his college institution, the United States Naval Academy. While playing for the Navy he was considered to be the best basketball player in the history of the school. In addition to that he is a two-time Olympic Gold Medal champion and a 10-time NBA All-Star Player. Robinson spent a good 14 years playing for the San Antonio Spurs before retiring, but he has plenty under his belt to celebrate. Robinson will be in Texas later this month to speak at the Wall Street Conference that is happening on January 19th. This will be a great opportunity for him to share his business knowledge with his fans as well as get to talk about some of his other past career challenges and victories. If your company is interested in finding out availability and booking fees for a former professional basketball player like David Robinson, Grant Hill other celebrities for Product Promotion, Keynote Speech, Guest Appearance, or Charity Event, call us at 1-888-246-7141.